If you want to know exactly what time it is, head of over to Boulder, Colorado, where a fountain of cesium atoms ticks off the U.S.'s official time. It should be accurate for the next 300 million years. But don't be impressed—the world's actual most precise clock is a few miles away at a different lab in Boulder, and it supposed to keep perfect time for 5 billion years, the age of our planet. NPR's Geoff Brumfiel recently paid a visit to the world's most precise clock, which looked, well, decidedly unofficial. "The basement lab that holds it is pure chaos" writes Brumfiel, "Wires hang from the ceilings and sprawl across lab tables. Binder clips keep the lines bunched together. In fact, this knot of wires and lasers actually is the clock. It's spread out on a giant table, parts of it wrapped in what appears to be tinfoil." The tinfoil and wires belie an extremely sophisticated piece of equipment called an optical-lattice clock. 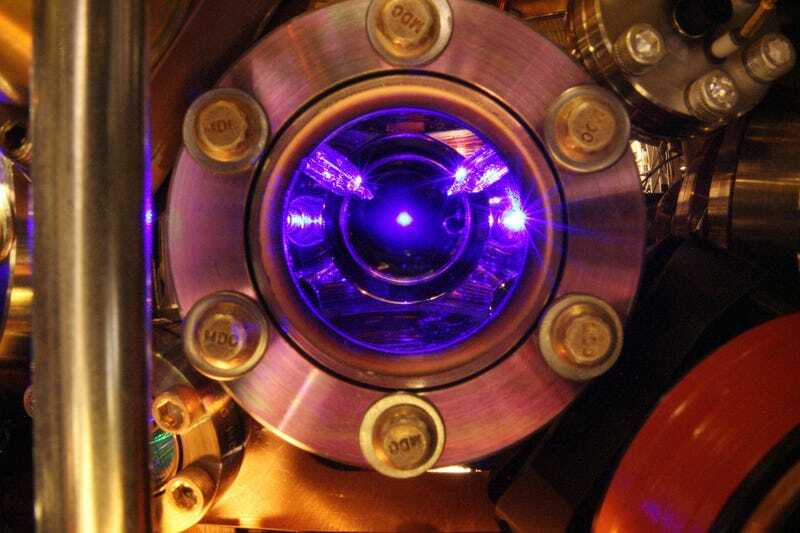 Instead of using a fountain of cesium atoms to keep time, this clock strontium suspended in a lattice of lasers. Strontium excited by light vibrates at a very high and regular frequency—about 10,000 times that of cesium—which makes it less prone to noise that can throw it off. You end up with an incredibly precise clock. But such a precise clock actually creates its own confusion for our humble human brains. Because of the effects of gravity, time actually passes more quickly at your head than at your feet. So what time is it really—head time or feet time? Read more about the physics of time at NPR.